It’s pretty impossible to describe the quality of the men who’ll be taking to the streets of London tomorrow, for what should be a fitting climax to the Spring marathon season. So far, we’ve seen a sub-2:05 in Rotterdam, a sub-2:06 in Boston, and now, the grand finale in London promises to be the biggest and best race of the year. It always is in London, thanks to a massive budget to bring together the kings of marathon running. This year, that budget was stretched to its limit when most of the top African stars found themselves stranded as a result of the ash cloud over Europe. A few private planes, $230,000 later, and all will line up in London, hopefully none the worse for their longer than usual journey. Simply put, there are too many accolades among those men to even remember! So to sum up, London 2010 brings together all three 2009 World Championship medalists, all three Olympic medalists, the defending champions from Chicago, London and Fukuoka, the fastest man in 2009, the Marathon Major champ from 2009, and the half-marathon world champion. So how might this collection of superstars be sorted on Sunday? It really is impossible to tell. Sammy Wanjiru has raced and beaten every single runner in this field in the last two years. His victory in Beijing’s heat in 2008 is regarded by many (including me) as perhaps the greatest marathon ever run, and he followed it up with brilliant, aggressive front-running victories in London and Chicago last year. Last year in London, he ran the 19th mile in 4:25 (2:45/km), typical of what he produces when on form. However, he has struggled with a back injury since Chicago, and has been handed some pretty big defeats in shorter races since that. It must be pointed out that pre-Chicago, he also didn’t come in with a searingly fast half marathon, and the same is true this time – a 61:33 in March. That’s almost the same pace as I would expect them to hit halfway in tomorrow, something just a shade under 64 minutes. So hopefully Wanjiru has managed himself and his build-up well and is in top form again. If he is, then the race changes complexion because of his front-running aggression, and you wouldn’t bet against him. He is the slight favourite. The big unknown, as mentioned, is Zersenay Tadese. The fastest half-marathon runner in history, and that was only a month ago, he is destined to be a brilliant marathon runner. Whether he can fulfill this on Sunday remains to be seen. I have concerns over the proximity of his half-marathon record to this race – it was only a month ago and to be in that kind of shape a month out from a marathon, with the need to have been doing marathon specific training in the build-up to that race, may be a problem. He may be slightly over the peak, and if so, would be found out in the final 10km tomorrow. Also, last year was a very disappointing performance – he was almost the first big name to drop off the lead group, just after half-way. But I am sure he will produce a much improved performance, and should be on the podium. The sub-2:04 performance will come in the future. The other huge challenger is Tsegay Kebede. He finished 2009 with performances of 2:05:20 in London, 2:08:35 in Berlin and 2:05:18 in Fukuoka. That gives him the fastest three-race average in one year in history, and he knows how to get it right in paced big city marathons – successive 2:05s shows this. Those three make up my likely podium, though I really don’t know the order. If I had to guess, I’d go Wanjiru, Kebede, Tadese, but this is on occasion where in half an hour, I might well have changed it around! And then there are so many other contenders. Don’t be surprised to see Mutai, Kibet and Kirui on the podium. I’d be surprised if any of them won it, and Mutai in particular is a guy to watch. What we have seen in recent weeks is that any one of perhaps two dozen athletes can break through to a 2:05-something time – who would have thought that Robert Cheruiyot had that in him, for example, and so this batch of men who lie just outside the 2:05 galaxy inhabited by Wanjiru, Kebede and Kibet are very dangerous indeed. And then there is the time. London has consistently assembled the best, deepest field in the world, but it seems that it may be just too tough a course for the record, with the depth of the field, the race tactics, and a lot of turns and the wind hampering the pace required to break 2:04. I would expect that tomorrow. London uses pacemakers, and so the early pace will be close to the World Record target, so expect halfway to be reached in about 62 minutes. But then it will begin to drop off, and with such a strong field, you can expect there to be ten men together at 30km. This is when the pacemakers drop off (if they even last this long), and this will cause a similar effect to what we saw in Rotterdam, with small surges being thrown, causing the pace to go fast-slow, and the record will gradually slip away. However, expect a sub-2:05, but not a sub-2:04. 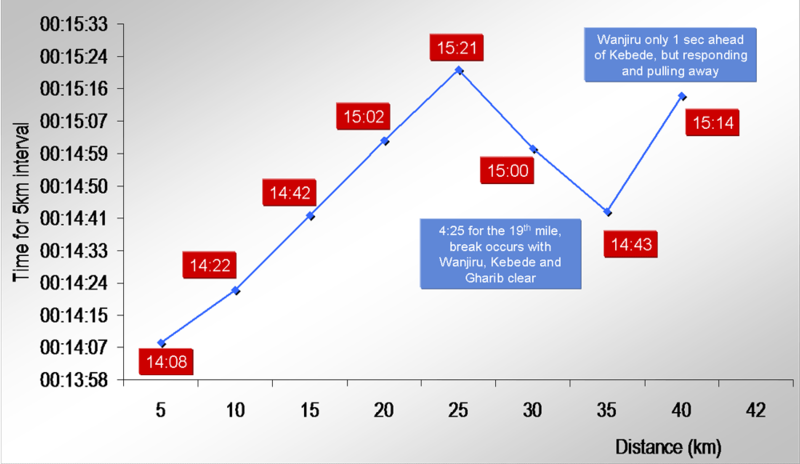 Finally, for comparison purposes, below is the pacing chart from the race last year. You can read our more detailed analysis from last year, here. You’ll see how incredibly fast it started (28:30 for the first 10km – 2:02:13 pace). Then it got slower and slower and slower, and by 25km, it was positively pedestrian. Wanjiru’s attack between 30 and 35km was incredible, and it will be interesting to see if the same happens this year. However, the death of her father, some time off and then a defeat at the hands of Shobukhova last year, along with some injury concerns, means that her attempt at three titles is under threat. Shobukhova produced a final 5km that was faster than Sammy Wanjiru at the same point in last year’s Chicago marathon, which she won in 2:24. She has also run in London, finishing third in 2009, and so is a major threat. Neither woman has performances this year, so we don’t know their condition coming in. However, they are the pedigree of the field. Challenges may come from the Chinese World champion, Bai Xue, and from the Berlin 2009 winner, Atsede Habtamu. Bai Xue has run 2:23, but at 21, she may yet have a substantial improvement in her. If that comes on Sunday, then she’s a big favourite, because the winning time in London is unlikely to be much faster than about 2:22, and so she’ll feature. Another name to look out for is Mergia Aselefech of Ethiopia. She was third in Berlin’s World Championship marathon last year, but earlier this year produced a 67:22 half marathon, which is substantially faster than anyone else in the field in recent months. So how might this race play out? The women’s race will be substantially less aggressive than the men’s. I would be very, very surprised if we even see four women together at the halfway mark (which will be reached in around 71 minutes, well outside world record pace), whereas I fully expect there to be ten men running in a group at 30km, at close to world record pace. That is the reality about women’s marathon running at the moment – it’s very, very weak, and needs an injection of the track capabilities of Defar, Dibaba and Abeylegesse to ignite to anything remotely like the men’s event. This of course means that the stage is set for someone to break through, and if you’re looking for a good bet, one of the Ethiopians is a favourite to do that. Both have run sub-69 minute half marathons this year, and have enough marathon pedigree to suggest more to come. I expect to see Shobukhova racing against either Aselefech or Habtamu over the final 5km. Shobukhova will win, probably in around 2:22, with the Ethiopians in second. Mikitenko to run a solid fourth with Mara Yamauchi in fifth (and probably getting as much TV time as all the men combined, if last year’s coverage was anything to go by). Overall though, it’s the men’s race that will produce the aggression and most excitement. Hopefully, we get to see it – last year, we missed much of the action, since the TV coverage preferred to show Mikitenko running a solo time-trial. That, and the fact that the commentators couldn’t pronounce half the names makes me hope we get a different feed this year, one that hopefully doesn’t spend ten minutes at a time watching nothing happen. As for Paris and Boston, I’ll be doing live splits, and commenting on the action as it unfolds, so join me tomorrow morning (SA time – 10am) for what should be a breathtaking battle.